Description: This course is designed to meet the requirements of OSHA for Incident Commander training of emergency response personnel who will respond to leaks or spills of chemicals for the purpose of stopping the leak or spill. It is specifically aimed at ammonia users, but will relate to many other chemicals. It can be tailored to other specific chemicals in your workplace. 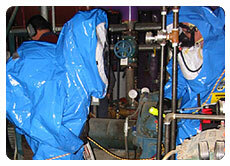 OSHA requires that all personnel who are expected to lead the response teams that respond to spills or leaks must have this training. Your plant should have a minimum of two trained incident commanders per shift. The Incident commanders come from a cross section of personnel generally ranging from members of management, engineering, maintenance, refrigeration, safety and production.